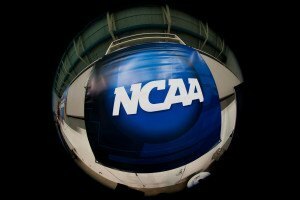 The NCAA adopted new rules this week aimed at reducing early recruiting – but the rules will actually allow slightly earlier official visits, causing the CSCAA to unsuccessfully request an exemption for swimming & diving. Kennett’s strengths lie in sprint free and breast. 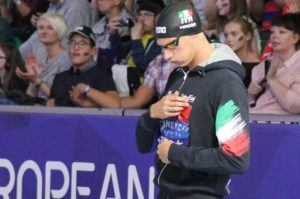 Italian sprinting ace Andrea Vergani has been temporarily suspended by Italy’s Anti-Doping Fedreation, NADO Italia for having tested positive for cannibis. Fantine Lesaffre, the top seed in tonight’s 400 IM final, already qualified for Gwangju with her performance at 2018 European Championships. The term “swimmer’s hair” is often used to describe any bad effect on hair that happens after swimming. Unfortunately that usage can be confusing because it combines several different chemical effects. The dry, damaged, brittle, bleached, “dead” feeling is caused by chlorine reacting with the hair. Pool chlorine is the same thing as bleach (think Clorox), so you should expect similar effects. Notably the pool chlorine is less concentrated, so the bleaching isn’t as fast or dramatic. Nevertheless, you should note the similarities in smell and effect – you smell like bleach and your hair gets lighter. That’s because you pool chlorine is bleaching your hair. The green hair color comes from copper depositing in your hair. When pool water contains copper, that copper can become oxidized by the pool chlorine to make copper (II) chloride dihydrate, which sticks to your hair and makes it green. 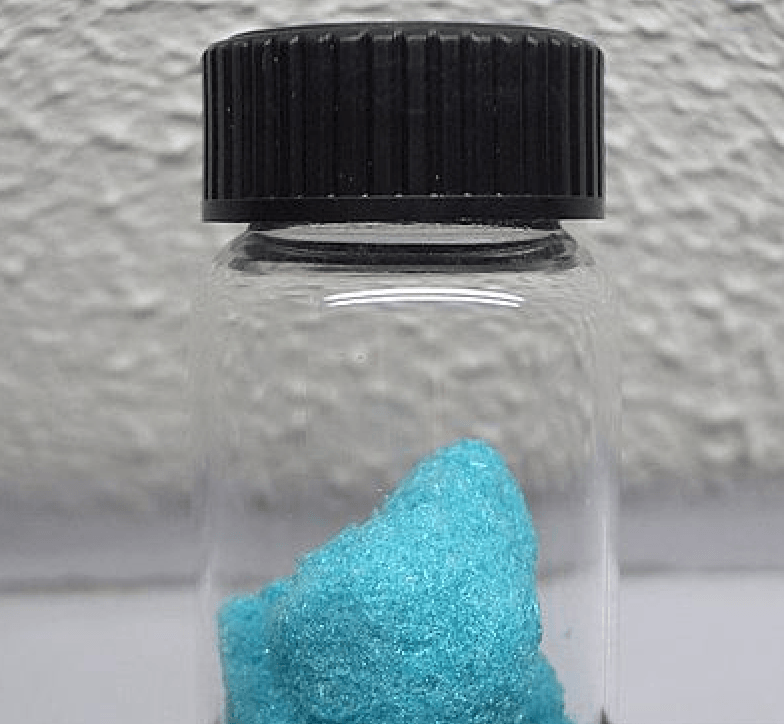 Take a look at the photo of this chemical isolated in a vial — note the color similarity between this chemical and swimmer’s hair, i.e,. green hair. Fortunately both the damage and the green color can be mitigated by preventing chlorine’s oxidizing effects. The best way to prevent chlorine’s oxidizing effects is to apply a concentrated antioxidant in the shower when you are done swimming. Vitamin C (aka ascorbic acid) is a great antioxidant. Here’s how to get chlorine out of your hair. See also SwimSpray’s video instructions. Note: you do NOT need a “swimmer’s shampoo.” Those shampoos are full of ingredients for lathering, color, fragrance, etc.. But they fail to provide enough of the ingredient that you need: a powerful antioxidant. This is why we invented SwimSpray. 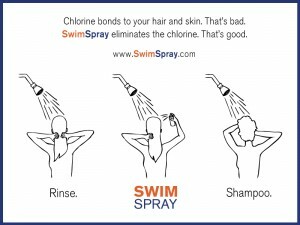 Other “swimmer’s shampoos” do not work. 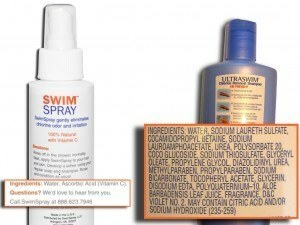 As surprising as it sounds, all swimmers shampoos fail to provide enough of the ingredient that you need. SwimSpray is the first product to provide you with a concentrated, pH-balanced solution of vitamin C in purified water. It provides a concentrated blast of exactly what you need (vitamin C) and nothing that you don’t (all those other ingredients). It works. You will notice the difference the very first time you use it because you won’t smell like chlorine. About SwimSpray: SwimSpray was invented by Dr. Andrew Chadeayne, a former Princeton University swimmer and chemistry Ph.D. from Cornell University. Tired of smelling like chlorine after his swimming workouts, Andrew set out remove chlorine from hair and skin ( SwimSpray works where so many other chlorine-removal products (e.g., swimmers’ shampoos) have failed previously because SwimSpray’s all-natural vitamin C based formula breaks this bond, neutralizing the chlorine, and allowing it to be washed away with your favorite soap or shampoo. Follow him on Twitter @swimspray and fan him Facebook. 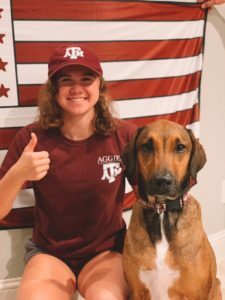 SwimSpray is a SwimSwam ad partner. I have a question. What about going swimming then bleaching my hair will it turn green, fry, or fall out? I know it’s still unhealthy but just curious. I am an avid swimmer and have ‘salt & pepper’ hair, although the grey is now becoming prevalent. I have been using either store bought shampoo and occasionally, special and expensive ‘swimmer’s shampoo’ bought at a salon. Neither are really effective as my hair is dry and lifeless. I have a habit of putting Shea oil after shampooing which brings the shine and texture back into my hair but unfortunately, this doesn’t last very long. I am toying with the idea of getting silver shampoo to highlight the grey in my hair but am worried there will be an interaction between this and the chlorine. Am I right? also where can I purchase your Vitamin C product? I also need some advice. My hair is absolutely fried. I have had a pool for the past 30 years, and have never ever had this happen.